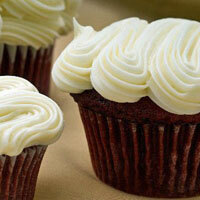 Yummy Cupcakes is proud to offer A Full Classic Menu of 430 (and growing) gourmet cupcake flavors! Vegan and Gluten-less gourmet cupcakes everyday and Sugar Free gourmet cupcakes every Friday and Saturday! If the flavor you want is not being baked on the day you want it, you are welcome to place a special order which lets you pick any flavor from our Full Menu. 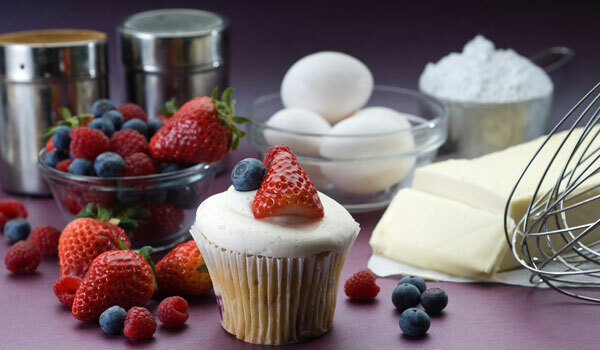 On special orders you need to order a minimum of 2 dozen of the flavor you select and place your order 4 days in advance, so we can get fresh product to make your special order cupcakes. Please order 24 hours in advance. Limited quantities in store every day. Pre-packaged in assorted flavors. Available in-store every day. $5.25 - $5.75 each depending upon flavor selection. Candles in a variety of colors and styles at $.10 ea. Novelty toppers include: balloons, ribbon curls, birthday hats, happy birthday signs, yellow duckies, engagement/wedding ring, cupcake rings and more. Prices range from $.25 to $.50 ea. Vanilla bean cupcake centered with fresh whipped cream, frosted with a chocolate/banana buttercream, a sprinkle of nuts and a cherry on top. Vanilla bean cupcake batter with melted chocolate mixed in to create a very light chocolate color, topped with vanilla bean buttercream with chocolate ganache mixed in. If you've ever had a Black & White Milkshake, you'll know the taste! Pineapple, Rum & Blue Curacao cupcake frosted with a whipped pineapple buttercream in ocean blue color, garnished with a mini umbrella. Chocolate cupcake infused with basil and frosted with a basil infused buttercream. Vanilla/cranberry/lime cupcake baked with a "shot" of vodka, frosted with a cranberry/lime buttercream, garnished with a sugared jelly "slice of lime"
Fresh orange and peach cupcake baked with a "shot" of vodka, frosted with an orange/peach buttercream, garnished with a sugared jelly "slice of orange"
A rich buttery cupcake with hints of nutmeg and vanilla baked with Meyers Rum, topped with a hot buttered rum buttercream with a rum kicker! Kahlua and coffee cupcake filled with whipped cream, frosted with a coffee buttercream and a dollop of whipped cream. Lemon cupcake with traditional Cajon spices with a spicy lemon cream cheese frosting. Lemon Drop cupcake made with fresh lemon juice, lemon zest, baked with a "shot" of vodka, frosted with a lemon buttercream, garnished with a sprinkle of sugar and a sugared jelly "slice of lemon"
Vanilla bean cupcake, centered with marshmallow cream, frosted with a light green vanilla bean buttercream, sprinkled with lucky charms…magically delicious! Chocolate cupcake frosted with a chocolate buttercream, topped with lots of M & M’s (plain)! Lemon/lime cupcake baked with a "shot” of tequila, frosted with a lime buttercream, garnished with a sprinkle of salt and a sugared jelly "slice of lime"
Light lemon and "7-Up" cupcake frosted with a light lemon/"7-Up" buttercream with a hint of grenadine, topped with a maraschino cherry! Chocolate peppermint cupcake frosted with a chocolate peppermint buttercream, each with peppermint liqueur to warm you up after a cold day on the slopes! Our version of the classic Italian treat. Chocolate and vanilla buttercream in a hard chocolate shell on top of a chocolate cupcake. Crack it open to enjoy!